Is your goal to run a marathon in 3:00? If so this plan is for you! In order to reasonably assume that you are capable of running a marathon in 3:00 with proper training it is assumed that you have run other marathons within 20 minutes of this goal time or have run a 10k in the past year in at least 38:30 or a half marathon in at least 1:26. If that is not the case then you may need to reconsider your goal and purchase a different goal-time plan. This plan is based on 3 weeks of increasing intensity load specific to your marathon goal followed by 4 days of recovery and testing before resuming training for the next 4-week period. Alternative cross-training workouts are suggested for recovery days along with easy run options. Weekly volume varies from 5 hours per week to 8 hours per week. Most weeks are around 7 hours. There is a day off every Monday to allow for recovery and rejuvenation. If you have training questions, you may post them on the Training Peaks Athlete Forum and they will be answered by a TrainingBible coach. On purchasing the plan you will receive an email within a few days giving you more detailed information on assistance should you have training problems along the way. You should start this plan 12 weeks prior to your marathon. It will guide you day by day to your goal. All you need to do is follow the daily workout schedule. It has worked for many runners over the past 7 years. BT: Warm-up 10-20 minutes and then start a continuous 30 minute tempo run at a pace of 6:40-6:50/mile (4:10-4:15/km). This is the pace you will run for miles 4-20 in the marathon. On soft but firm surface, heart rate in zone 1 only. Pretty form and quick cadence. Very easy recovery spin on a flat course. Best on road bike. Small chain ring only. Swim several long, easy sets. Focus on form. Count strokes per length trying to reduce them with efficient technique. Cadence should be in the range of 45-55 strokes per minute. BT: Warm-up 10-20 minutes and then start a continuous 30 minute tempo run at a pace of 6:40-6:50/mile (4:10-4:15/km). Cool down with slow jogging or walking for a few minutes afterwards and then stretch. Has has been coaching for over 15 years. He and his partner, Joe Friel, started TrainingBible Coaching and are the leading endurance authors. 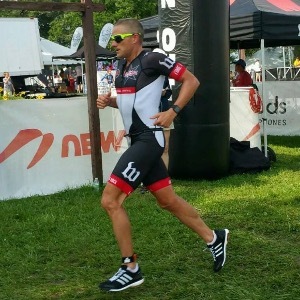 Adam has coached countless athletes to PRs and to Kona Qualification including Ben Kanute, US Olympian.